If you have read the section on Technical Analysis then you will understand that you can build substantial long term profits with technical trading strategies. You should also check out the section on Currency Price Movement which gives you the inputs behind the price action of currency pairs and show you, how and why FX prices really move. 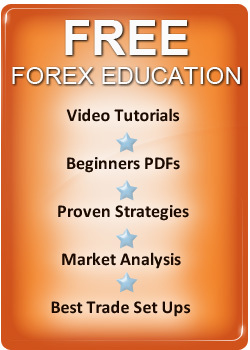 Here we will look at how to use FOREX charts correctly and avoid the basic errors which many traders make. Charting is an art which can be learned by anyone and takes very little time to learn if you have the right education. While you will have losses with any technical system, if you have a logical and odds based strategy which minimizes losers and runs winners, you can build substantial profits with your trading signals. Here we will look at the key points you need to keep in mind, when building your technical trading strategy for profits. In terms of currency markets the aim of using your charts is to get in and trade trends either up or down. You can focus on long or shorter term time frames but which is the best time frame to trade? No trader should day trade or scalp within the trading day and this is because, while the price trends may look orderly after they have occurred, there random. In addition, fees and spreads, mount up for day traders and profits are so small, they never cover a traders loses. If you look at monthly and weekly charts, you will see periods where a currency pair can trend for weeks to years in length which can be traded these for profit. These big trends are always there and always will be, this is because they reflect the longer term economic cycle and trading them can be very lucrative. Most traders want to be more active and trade shorter moves which can last for, a couple of days to around a week in length. Shorter term charting strategies will use the daily charts and will aim to buy a currency which is oversold or sell a currency which is overbought and this method of trading is referred to as swing trading. Lets look at some basic rules for success, in following long term trends and how to trade overbought and oversold levels in the market. Prices spend time trading tightly in ranges with low volatility or they are moving in trends up or down. When a currency pair is trending, you can trade in the direction of the trend and when prices are moving sideways and in a period of consolidation, you can trade the range and sell into the top of the range and buy into the bottom. Both methods work and you can use a trend following or range trading strategy depending, on how the market is trading at any time. An understanding of support and resistance is needed to trade successfully, with any trading strategy and it's easy to understand and learn. Support and resistance lines can be vertical or sloping and there are plenty of high odds chart formations which contain both, like ascending or descending triangles. The general rule of trading support and resistance is - the more times a level is tested and holds, the more likely the level is to hold. However when a breakout of a strong level of resistance or support occurs, a great low risk buying or selling opportunity. If you look at price trends in all currency pairs, you will see all the long term trends, start with a breakout and in long term trends prices continue to break to new highs or lows, as the trend matures. In terms of using charts a breakout strategy is a profitable way, to trend follow the long lasting trends. So far we have talked about price action trading and price action trading strategies are favoured by many traders because it's such a simple way to trade but there are also a huge number of trading indicators you can use, to improve market timing so let's take a look at them. Should You Just Use Price Action or Indicators to Generate Trading Signals? There are many traders who simply want to use price action trading systems and not use any indicators at all and this method can work well – particularly in longer term time frames. In terms of using trading indicators I think using a few selectively is a great way to improve market timing and to filter trading signals, so only the best trades are taken. Many traders like to overload their strategies with to many indicators but this doesn't work. Using just a few indicators can improve your system in my view because you get a deeper insight of price action. Momentum indicators allow you, to get a view of volatility and how overbought or oversold a currency pair is will help you maximize profits. Simple moving averages are one of the best trading indicators you can use because, they give you an idea of the average price over a set period of time – so why are they so useful? Prices tend to move up slowly over time and short term spikes up or down, are due human emotion. After prices have moved up or down sharply away from an a moving average, they tend to come back to the average, therefore in an up trend, you can initiate a buy signal on a move back to the average or sell a short term spike away from it. Momentum indicators simply give you an idea of how overbought or oversold a currency pair is and this can help you filter your trades so only the best risk to reward trades are entered. A good example is if you see a significant breakout of a resistance level, if momentum is overbought, the breakout may lack strength and fail to continue. On the other hand if momentum is not overbought and a resistance level breaks, the odds of a breakout continuing are increased. When you are trading ranges, you can watch shifts in momentum to see if a support or resistance level is likely to hold or break. After you built a strategy your happy with, you may want to test it before you trade it and we will look at a fatal error many traders make which is to curve fit their system so what is curve fitting? Let's take a look. Many traders like to test their systems on back data to see how profitable their system is before they trade it live in the market and this is a good idea but most traders make a fatal mistake when back testing which is to try and curve fit it to data to make a profit. They look for perfection and end up bending their system, to fit the data which their testing. When they don't see a profit, they keep adding indicators and rules, so the system makes a profit – so what's wrong with doing this? Markets look orderly going backwards but price action will never unfold in quite the same way again and this means, a system which has been fitted to past data, will probably fail in the real world of trading. To avoid curve fitting, keep your trading system as simple as possible and you will find that, it will easily out perform a system that has to many inputs which has been bent to past data to make a profit. The charting techniques which we have discussed so far, can make you profits and you will notice, there is no perfect way to make money with charts. There are many different technical trading methods which will work and you need to build your trading system, around the general guidelines outlined above. If you do, you can build a trading strategy which suits your personality and will give you, the confidence to trade it with rigid discipline, to help you enjoy long term profitability. The market is all powerful and you need to obey its rules to enjoy success but you can make big with FOREX charts. while no technical system is perfect and will win all the time, if your system is based on sound principles, you can keep losses small and make bigger profits to cover them and make profits long term. Charting your way to profits in the currency markets is similar to, the way the captain of a ship uses charts on the ocean. You know the ocean is all powerful just as the FOREX markets are but just a ships captain knows, charts can help him navigate the ocean safely the successful chartist knows his charts can help him navigate the the currency markets and make overall profits on his trading signals.